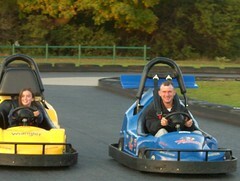 We headed over to the Putt Putt Golf and Go Kart place for one last go around the track before they close for the winter. FM is not one to “let” FG win ~ as you can see by the “I’m ahead of you” grin on his face. Since we did this last year, FG has added this to our “traditions” list and expects to do the “last race of the season” for the next few years we’ll be here. FG loves to establish traditions ~ it gives her a sense of belonging so even if we’re not in the same place or home, we can still do the same things. We’ve kept some of our traditions from Germany which I love as much as she does. I read on a blog recently that the blogger refused to start any traditions for fear of not being able to do it one year and causing disappointment in her children. What about you? Do you establish traditions or make an effort to avoid them? I love the idea of traditions. I think it is especially important for kids who move around a lot. Sometimes a new place has new tradtions to establish too. We have enjoyed going to the pumpkin patch with our kids and have now included the grandkids in the fun. The Christmas tree farm is a wonderful one too. When we moved from the city of Pittsburgh we had to find a new farm to go to. They have a great picture of Tray displayed on their photos wall with Santa. Children, especially girls, are disappointed when tradtions are not met. But, they get over it, and move on to new ones. Nothing lasts forever and that is one of life’s lessons too. We have a few traditions that have just kind of accidentally happened the last couple of years, like visiting a farm/pumpkin patch in the fall wherever we live. We’ve seen 3 different ones in the last 3 years! Other than that, we’ve got routines moreso than traditions that the kids really enjoy and that we do no matter where we live; like Friday nights is usually pizza and movie night and Sundays we have ‘Sunday’ dinner unless we’re having a ‘Sunday’ Drive… I think it’s even more important to have traditions and routines when we move so often, so the kids have a feeling of continuity and sense that no matter where we live our family is still intact. Some traditions will go every other year, some change locations, sometimes we just start new ones altogether – but the key to this is making memories and making them stick with photos and “remember when” conversations.